Two men have been charged with firearms offences after a haul of weapons was recovered in Elstow on Thursday (25 January). Matthew Lee Harwozinski, 28, of Mareth Road, Bedford, and Ricky Garner, 47, of Abbey Fields, Elstow, were both arrested after officers found 23 firearms at a number of addresses in the village, along with prohibited ammunition and tools used to modify and convert weapons. Both have been charged with manufacturing prohibited weapons and ammunition. In addition, Harwozinski was charged with selling or transferring weapons and ammunition. They appeared at Luton Magistrates’ Court on Saturday,January 27, and have been remanded in custody pending a future court hearing. 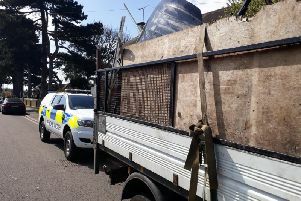 The operation was led by Bedfordshire Police assisted by the Metropolitan Police, National Crime Agency (NCA) and Eastern Region Special Operations Unit (ERSOU). Assistant Chief Constable Mark Lay, said: “This is a significant recovery of firearms – one of the biggest ever carried out by Bedfordshire Police and I’m grateful for the support from the NCA, ERSOU and the Met.